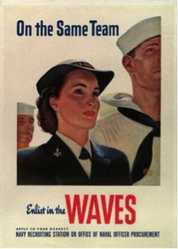 Born in 1924 on a farm in Scarborough, Maine, Florence Ahlquist (known as "Flonnie") was well suited for what became her role in the WAVES (Women Accepted for Volunteer Emergency Service). Graduating from high school in 1940, her skills led her to become a ship-fitter at the South Portland ship yard building Liberty Ships. Her background of having learned to read technical graphs to fashion Norwegian sweaters gave her an eye that supervisors recognized as the needed skills to read blueprints. Consequently, they trained her for aerial camera repair. Hunter College in NYC became boot camp for Flonnie. Except for arms training many aspects of it was very similar to the men’s boot camp. Strict regulations were set in place concerning dress, conduct and physical health. Flonnie’s page boy hairstyle was cut to shoulder length and she was instructed to always keep it up off her shoulders, away from her face and in an attractive yet modest manner. Two sets of uniforms with appropriate shoes, hats, gloves, purses and coats were provided with seasonal weight. They were sharply dressed and expected to not only be sharply coiffured but to conduct themselves in a respectful manner. After required testing, the WAVES were divided into special areas of training. Many of the women became clerks, cooks, a few became mechanics, medical aids and the nursing corp, and a very few went into specialized training for aerial camera repair; this was where Flonnie served. The military was just getting into the field of aerial cameras, and since it was new, the cameras were often breaking down and required both special skill in keeping them in working order but also in handling them in the air. They were very heavy and cumbersome, yet intricate. Flonnie was unusually adept to meet the technical tasks she was called to undertake in the Navy. After completing boot camp at Hunter College she was assigned to six months intense training at Fairchild Aeronautical School (Fairchild Aviation Corp 475, 10th Ave) New York. She stayed right at Hunter College and commuted to the school. There were also men in the camera repair school. Fairchilds was one of the earliest companies to pioneer aerial photography and when America needed them, they were ready to step up and make their knowledge and training available for the military for aerial surveillance. As early as 1935 the federal government had contracted with Fairchilds to procure aerial images of the United States and Flonnie's parents had signed papers allowing Fairchilds to take aerial pictures of their farm and land in Scarborough. Flonnie’s background of having been able to read patterns and turn the patterns into knitted and crocheted wear, which, in turn, developed into quick ability to translate blueprints into ships; laid a perfect groundwork to deal with the intricately built, yet cumbersome cameras. Coming from a farm family that often had to innovate, she proved to be a very capable and quick learner. She graduated top in her class which gave her the privilege of having her choice as to where she would serve in the United States. She chose the Naval Air Base of Corpus Christi, Texas located on the Gulf of Mexico. It was only four years old and was training pilots. They needed camera repair technicians. Taking a train across country, Flonnie arrived at her assigned base in late spring 1945 and began to settle in. She found that she was the only woman on a team of 39 men who dealt with the cameras. She wrote home that it was like having 39 brothers instead of just three! But unlike having a certain seniority at home as the eldest, she had to earn her place with the other repair technicians---which she did with her skill and clear capability. They soon respected her steady work and no-nonsense style. Her commanding officer and co-workers were impressed with her innovation and skill as she used alternative materials, like baling wire, to perform tricky repairs and create replacement parts. Flonnie was amazed at the lack of replacement parts, so innovation was a real requirement! They all came to look upon Flonnie as their sister, friend, co-worker and sometimes model as they tried out their cameras. They also became her guardians reviewing every sailor who tried to date her! So sparse were the parts to repair the cameras that Flonnie became highly valued for her innovation. She frequently had to visit the local junk yards to scrounge for parts that could be adapted. Those years of re-working parts on the farm proved valuable lessons. One particular sailor was able to pass muster with the tight knit team of co-workers. His name was Gerald Link, originally from Patterson, New Jersey. Jerry was eight years older than Florence. Jerry had already served for several years in the Seabees. He had been stationed in Trinidad where the Seabees built Army and Naval bases. The British island of Trinidad, off the coast of Venezuela, was the southernmost bastion of the United States protecting the Caribbean and the Panama Canal. When Great Britain declared war on Germany in 1940, the U.S. Navy sent the Seabees to the island to build observatory stations, air bases and barracks for the American troops who were charged to protect that strategic area. The American Army and Navy had moved into the island in 1941. 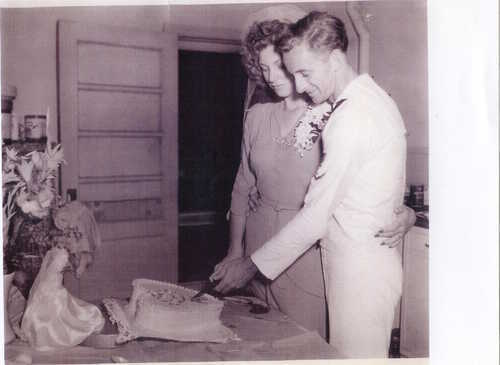 When Jerry’s enlistment was up in the Seabees he chose to re-enlist in the Navy and became a ship’s cook. Jerry knew the way to soften all these ‘brothers’ resistance was to come bearing gifts of food, which was exactly what he did! Jerry became acquainted with Flonnie’s best friend in the WAVES, Lorraine Henderson, who was a clerk on the base. She introduced Jerry to Flonnie; and with very careful planning, Jerry made sure he brought plenty of snacks to keep her co-workers occupied and happy so he could date this tall, blue-eyed blonde who had definitely caught his attention. Jerry successfully pursued Flonnie and they were married 16 June, 1946 at the chapel at Corpus Christie, Texas. 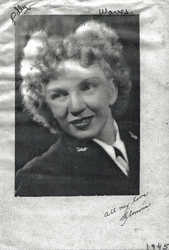 Flonnie had completed her work with the WAVES and was honorably discharged on 12 February 1947. She had attained the rank of Specialist, 2nd Class V-10. 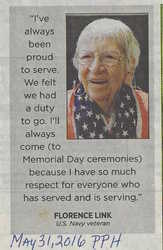 She had served since 24 August 1944. Part of the criteria with women in the Service was that they could not be married, but the war had ended the prior September and she had served well. Jerry had a few months further to complete his service agreement, then they would both be free to come home to Maine.